UPDATE 2015-05-15: PDB Base. The two files for the lower (BL_PDB) and upper (BU_PDB) base parts offer the ability to mount a pdb (abusemark or one with integrated step-down-converters) and the FC or even an OSDOGE sandwich-style for some extra neatness. v3 offers a few minor improvements. The MT220 quadcopter frame is a very small and sturdy frame for a full size 250 setup. 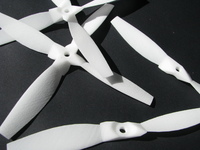 To my knowledge it is the smallest folding H-frame for 5" props. -holes for zip ties to secure ESCs, PDB, VTX, Battery alarm, asf. zip ties, loctite, double sided tape, heat shrink, stuff to mount your fc and camera, etc. hardware needed: M3 locknuts and screws in several lengths, M3 35mm spacers, some loctite and quite a few zip-ties.